Do blind birds bob their head when they walk? Birds try to keep their heads still for short periods of time between steps to improve their ability to see. You can find amusing videos of chickens used as small video camera stabilizers. But does this happen to blind birds? Is it something all birds do regardless of their ability to see? 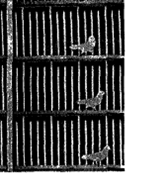 The forward thrusting movement so peculiar of pigeons and other fowl (Fig. 1) while walking is thought to be related to shifting the visual field. The less visible backward motion of the head is thought to be related to fixating the field of view (Dunlap & Mowler (1931). According to the meticulous observational study by Dunlap & Mowler (1931), blindfolded pigeons stop making head movements altogether while walking. They stop their forward thrusting motion, the backward motion as well as more random scanning head movements. Hence, the authors conclude that the forward and backward jerking movements are related to vision, and not to hold their balance or whatsoever. Not the answer you're looking for? Browse other questions tagged vision ornithology or ask your own question. How do baby birds get fed when they are only a day or two old?